Behold the feather duster. Kind of a controversial topic I have discovered. Apparently they are a rare mutation of the English Budgie. I recently met Munchkin a feather duster hatched at J & M Aviaries in Austin, TX. I remember when Linda and Jerry told me they might have a feather duster baby. They were hand raising a few budgies and one appeared with unusual feathers. At first they thought it might be a disease such as psittacine beak and feather. They had even thought they might need to euthanize the bird to protect the flock. Fortunately they realized what they had on their hands was one of these rare mutations. The controversy over these parrots is that there is concern that they don’t live long and that the feathers create a hardship in their lives. This can mean challenges seeing and also keeping the feathers clean. The shorter life span has been attributed to the nutrient requirements for feather growth. All of this may be true for some, but what we all wondered is how many people actual have the opportunity to give a feather duster the kind of attention it needs to live a healthy life? As a small facility J & M is able devote plenty of time to each bird. 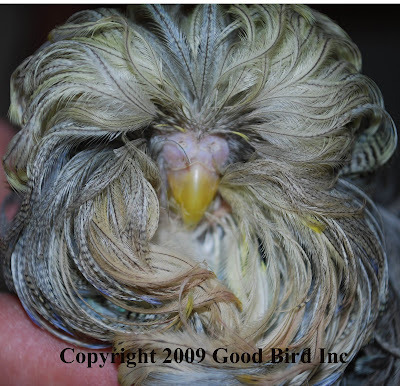 Larger aviaries that hatch a feather duster may not have that luxury. Munchkin goes home every night with staff and is attended to all day at the aviary. As a hand raised baby he is extremely engaging and appears to respond enthusiastically to attention. In this video clip, you can see him perk up when he hears his name called and spin circles when Linda comes closer. 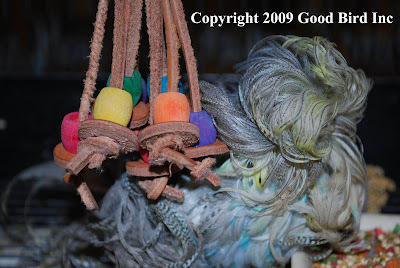 In one article I saw comments that it was unkind to allow feather dusters to survive. I found this difficult to agree with after watching Munchkin. He certainly did not seem to be suffering and in fact he was as vital as any bird I had seen. He has a preferred toy that he rests up against (made by the Leather Elves….Robin is quite proud I am sure!) and probably gets more attention than most parrots I know. Working in bird shows for so many years I often had the privilege to work with and train some unusual cases ….a blind Harris Hawk named Storm; a Barred Owl with brain damage due to a head trauma named Mr. Magoo, and an amazing wing injured Bald Eagle named Hope. One thing that amazed me is how adaptable these animals are. As with any animal the goal was always to use positive reinforcement to help makes their lives as rewarding as possible. And in turn they helped educate and inspire so many people despite their personal individual challenges. I hope people can look at Munchkin as a special bird who happened to hatch into the hands of some people who care deeply for him. With any luck he will teach us more about this unique condition and how best to care for feather dusters. At the risk of sounding cliche, it's true that you learn something new every day! I really enjoyed reading about this rare bird. Thanks for the educational experience and story! And since I've had the pleasure of meeting Jerry, I found this to be an even more enjoyable story! At the risk of sounding cliche, it's true that you learn something new every day. 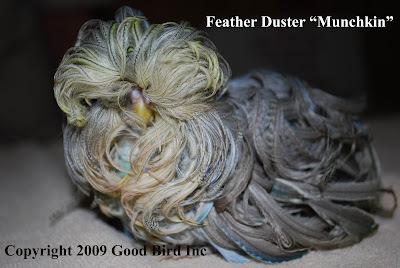 I really enjoyed learning about the feather duster! This story is even more special to me, since I had the pleasure of meeting its caretakers, Jerry and Linda. Thank you for the educational experience and wonderfully written story, Barbara!